In this book, Jaime Rodriguez Matos proposes the "formless" as a point of departure in thinking through the relationship between politics and time. Thinking through both literary and political writings around the Cuban Revolution, Rodriguez Matos explores the link between abstract symbolic procedures and various political experiments that have sought to give form to a principle of sovereignty based on the category of representation. In doing so, he proposes the formless as the limit of modern and contemporary reflections on the meaning of politics while exploring the philosophical consequences of a formless concept of temporality for the critique of metaphysics. 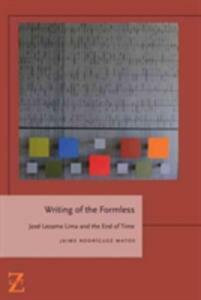 Rodriguez Matos takes the writing and thought of Jose Lezama Lima as the guiding thread in exploring the possibility of a politicity in which time is imagined beyond the disciplining functions it has had throughout the metaphysical tradition-a time of the absence of time, in which the absence of time no longer means eternity.